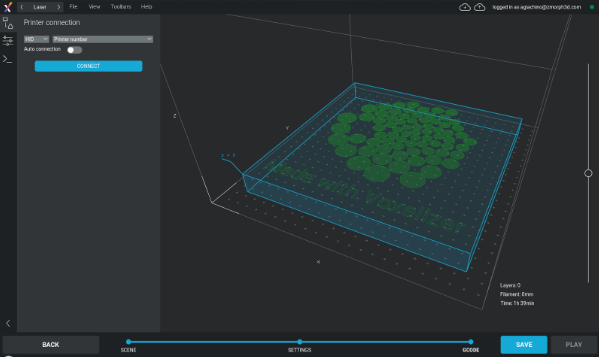 Voxelizer easily allows you to generate paths for your laser toolhead, in this article we will look at the specific workflow. First of all, make sure that you have your laser toolhead selected. By selecting File → Import → Dxf you can import the file or files that you want engrave. In the DXF arrangement tab you can apply basic transformations (move, scale and rotate) to your drawings as well as grouping and ungrouping paths. Read here how you can import and work with images. The Drawing tool tab offers the possibility to add simple shapes and text to your drawing. Once you click next you are in the Settings Editor. Here you can set up the commands to send to your laser. 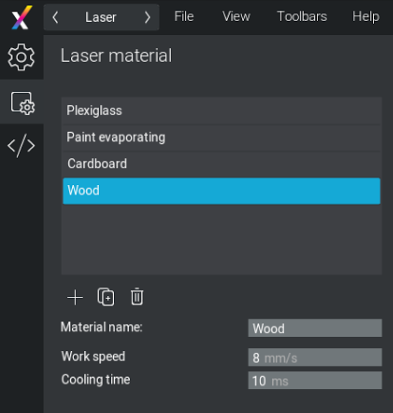 In the second tab shows the Laser material settings: here you can create and modify materials by setting the speed of the laser head while burning (work speed) and its cooling time before traveling (Cooling time). The first tab is the Laser Settings tab. Here you will provide the operation parameters for your laser. On top there are the Laser settings, here you choose the material you are working with (with the parameters set in the previous step), the speed of the head while not burning (travel speed) and the safe height for travel above the material. After providing these setting you can assign operations to your paths. You can select a path and assign an operation to it, or you can assign an operation to all the paths in your scene. Engrave: Engraves the contour of the path, in one or more repeats. Hatching inside: hatches the inside of the paths. Hatching outside: hatches the outside of the paths. Hatching inside and Hatching outside only work on closed paths. Laser connected hatching will hatch following a continuous path whenever possible. This will lead to time savings but it is also possible the material may burn. In the example below we apply an Etching inside operation to the circles and an Engrave operation to the text. 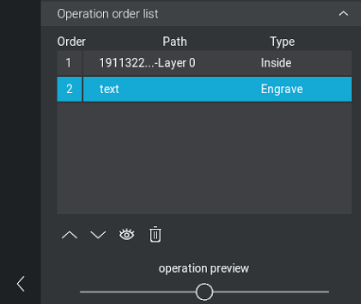 In the Operation order list you can change the order of the operations, as well as looking at the details of each one of them (by clicking on the eye), or delete them. By scrolling the slider you can have a preview of the path that the laser toolhead will follow for the operation selected. When you are happy with your operations, you can click Next and generate the gcode to send to your machine.